Exell 18650HP 3.7V 2500mAh LiMN Battery is an ideal replacement battery for many of todays in demand applications such as E-Cigarettes also known as MODS, Vaporizers or Vape products as well as high intensity LED flashlights and Solar Lamps used in gardens and walk ways.This LiMN battery has three-dimensional tunnels that enable rapid diffusion of Li+ through LiMn2O4 particles, and therefore lithium-ion cells made with this material can have better theoretical drain rate capability. Conventional lithium-ion cells use LiCoO2 or variations of that material. Cells with LiCoO2 cathodes are typically designated with the term "ICR". The LiCoO2 type materials have a layered crystal structure that only enables 2D diffusion within the layers, so the overall Li+ diffusion rate is slower. 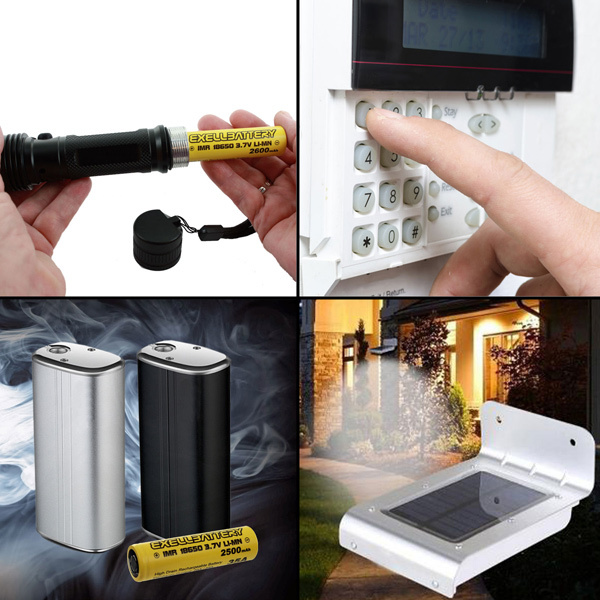 Exell 18650HP 3.7V 2500mAh LiMN Battery Applications: Solar Lighting, Home Security Systems, Digital cameras, Electronic Cigarettes, E-CIG, MODS, Vape, Vaporizer, GPS, Digital calipers, calculators, electronic clocks, medical equipment, measuring instrument, sensors, radio transceiver, and many other electronics. Need more Exell Battery 18650HP25_2QTY_18650-CASE? We offer great discounts on quantity orders and FREE SHIPPING offers are available. No specification or documents available currently available for 18650HP25_2QTY_18650-CASE. If you require a spec sheet, a msds sheet or any additional documents, please contact us and to request them. We will work to accommodate you.